The sought-after Philosopher’s Stone brings heaps of fortunes when you play Secret Elixir with Bitcoin. Catch this Novomatic slot in Bitcoin casinos. The search for the Philosopher’s Stone continues. For centuries, alchemists and geniuses have longed for this special element that is believed to turn any metal to gold. 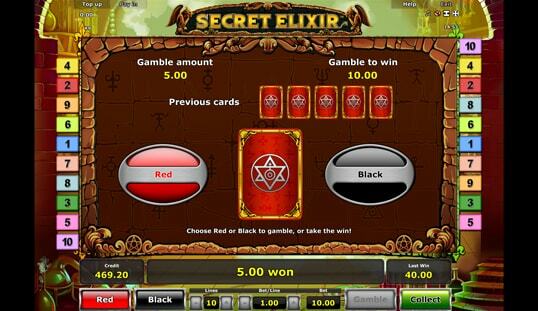 What they did not know was that what they sought for is now found in Secret Elixir slot where tons of golden coins are rewarded to the lucky and deserving players. Give each spin your best shot and win bitcoins just like that. 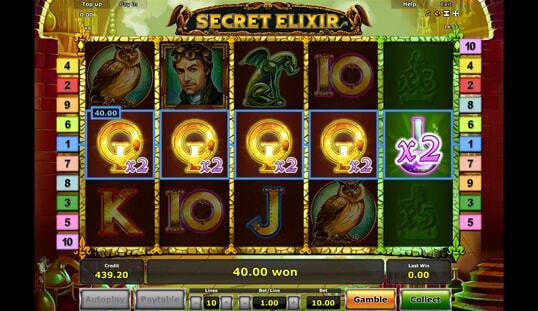 Find out why you should absolutely experience playing this Novomatic slot released in 2012. This slot features state-of-the-art graphics, which are evident in its high-quality visuals that are vastly improved from the game supplier’s early portfolio of slot games. It features designs rich in details and colors that are topped by attractive animations all throughout the game. Apart from the entertaining visuals and design, its sounds are spot-on. Although the usual background music played in most online slots, it seems that this one chose not to adopt that feature and just went with the effects, resulting in a great combination of visuals and sounds. When you play Secret Elixir with Bitcoin, there is no question as to how fun and entertaining this experience will be. 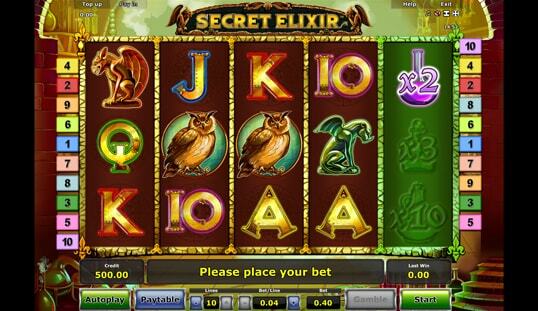 The game is packed with special features designed to make it stand out from the rest of the online slots. The betting interface is composed of five reels and three rows filled with various symbols. There are 10 regular symbols that provide different wins based on the formed combination from left to right. 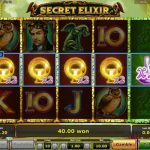 Other than the standard symbols, the Secret Elixir Bitcoin slot also has special symbols that easily boost your chances of collecting more prizes in every spin. Present here are the usual additions like the Wild and Scatter symbols, which complete the line wins and triggers the free games, respectively. Completing its offering are the magical potions that appear only on the fifth reel and multiply every win. 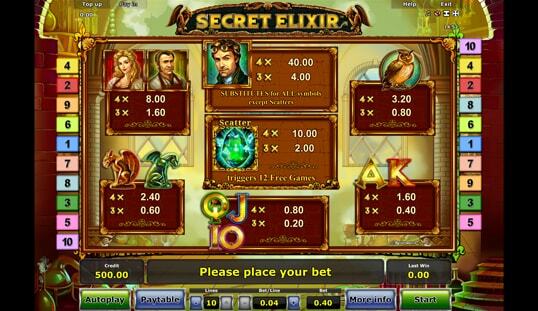 Instead of opting for a bonus game, Secret Elixir slot features 12 free games, where all line wins are multiplied by up to 20 times. A total of five unique potions will appear on the fifth reel and maximize the prizes. Of course, the free games can only be unlocked when at least three Scatters appear on a paid line. Catching the Philosopher’s Stone is the key to unearthing huge line wins, so push your luck to have the Scatter symbols appear on the reels when you spin them. 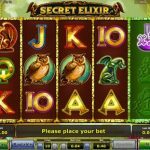 Together with the high chances of collecting lots of prizes, the user-friendly gameplay of the Secret Elixir Bitcoin slot is guaranteed to give you an excellent slot betting experience. 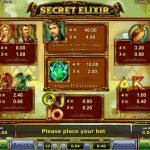 Play Secret Elixir with Bitcoin now on BTC-Casino.io, FOrtuneJack, Vegas Casino to enjoy all this.